Many skeptics of the success of Apollo 11 claim the "waving flag" as ground for believing that the Apollo mission was faked. In many pictures taken during the Apollo 11 mission the flag planted on the moon seems to be waving, as if it were being blown about by wind. There is no better way to depict a success of a nation than by firmly planting its' flag in the ground and claiming a victory for all of mankind. It makes perfect sense then for Neil Armstrong to have planted the flag on the moon after stepping on its Dusty surface. In fact, this ritual is performed by all nations. They too proudly bear their nations emblems on the body of space shuttles, satellites and the like, and as long as they are successful, their government is happy to pick up the bill. The purpose of these emblems is publicity. The goal of these agencies is to keep people interested, as well as to spread knowledge. Unless these agencies make their presence known in a fashionable manner this goal cannot be accomplished. 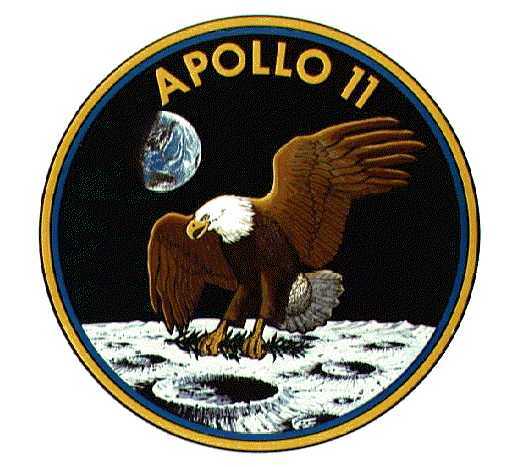 The first image is the official emblem of the Apollo 11 mission. In the second image, the Russian space program emblem is visible in the control room of the agency. The third image is of the SOFIA infrared telescope, a joint project between NASA and the DLR of Germany. The flag does in fact appear to be waving in the still picture below; there is no contesting that point. Skeptics automatically assume that this is sound proof that the flag was being planted on Earth and not the Moon. However, there is one aspect of this photograph that is important to note. Both Armstrong and Aldrin are touching the flag in the process of planting it into the moons surface (which, as I have previously stated, is covered in a layer of dust). Skeptics have ignored two important facts in this instance, but we will return to those in a moment. Most would agree that NASAs' scientists are among the most brilliant people in the world. It is, therefore, natural to ask why anyone would assume that these men (and women, today) would be so ignorant as to ignore the fact that a flag would flutter being planted on Earth (on a windy day that is), but would not when being planted on the Moon because it has no atmosphere? There is a simple answer to this question; they would not. NASA's scientists are, and were, aware that there is no atmosphere on the moon. As such, they were more than prepared for this fact when they sent a flag with Apollo 11 and made sure that the flag would be constructed in such as way that would allow onlookers to see all of the stars and stripes. On the Earth, flags are usually hung from a pole or rod. On the Moon the flag was hung in the same fashion, but with a second rod protruding parallel with the Moons surface from the first rod. It is from this rod that the flag hung, forcing it to stick straight out and be visible. For appearance purposes this rod was slightly shorter than the flag itself, giving it that rippled effect (that is, after all, how we are all use to viewing the flag). Furthermore, when NASAs' scientists sent Apollo 11 to the moon, they had public policy in mind. When it comes to viewing the flag on the moon, which would make for a better presentation: a limp, dreary flag, or a flag standing proud in its nation's namesake? I think the response is obvious. The fact is the U.S. flag appears to have ripples in it in photographs on the moon because NASAs' scientist intended it to. To better present how such a design would make a flag appear, I constructed two flags and took video footage of the flags in two settings. One flag was constructed as NASA constructed the flag planted on the moon; the other was constructed as flags typically are for display on earth. In one situation, the flags are presented outdoors so that you may observe how flags constructed differently behave in a windy environment. This clip shows you exactly how the flags appear when waving. Notice that the flag constructed as NASA did does not ripple exactly the same every time it is blown, notice also that the bottom tale of the flag (the one not connect to the pole) flips when it is blown, it does not stand still as the rest of the flag waves as the flag in Apollo 11 pictures did. The second clip is of the flags in an indoor setting. We are unable to simulate the exact conditions of the moon because we lack the equipment to create a room with no atmosphere. However, this clip shows you how the flags behave in a windless environment. Notice that the flag constructed as NASA did has ripples in it just as the flag on the moon does. Notice also that those ripples do not change, again just as the ripples on the flag on the moon do not change. The gentleman in the background is present to demonstrate that there is actually motion in the video. Returning to the fourth picture on this page, we see that the flag "ripples" and that Armstrong and Aldrin are planting the flag into the Moons terrain. What skeptics have ignored in this instance is that 1) Armstrong and Aldrin are, in fact, touching the flag, and 2) that the Moon's terrain is mostly dust. The "waving" of the flag is very easy to explain. 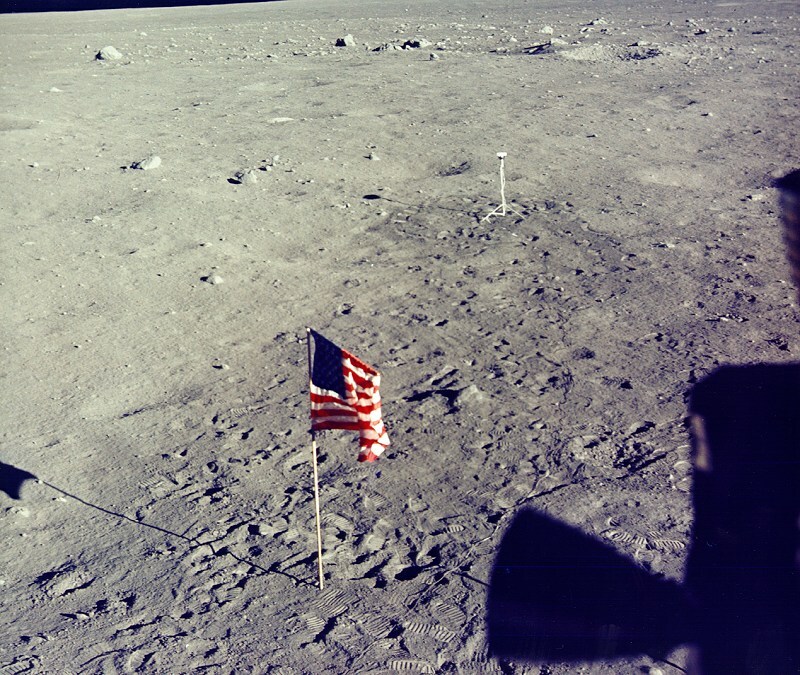 To plant the flag Armstrong had to twist it back and forth in order to get it to stand in the moons soft surface. It was this movement that makes the flag appear to be "waving," not the wind. Visit the links below and review the pictures found. Careful observation of the Apollo 11 flag in these pictures reveals that not only can you easily see the bar which sun. For example, near the edges of the flag not supported by a pole, the flag "flutters" one direction and then back the opposite direction. This type of uniformity could not be accomplished if the flag were fluttering due to a breeze. The diagram below depicts where each flag was located. The flag in the center represents the idea that the flag is facing the Lander. The small circle is the Lander itself, and the large circle represents the Landers' field of view from the front of the craft. Photographs one, two, and three are all taken at the same angle. Photograph four is taken at the opposite angle. NASA has made mpeg videos from clips of the original films from the moon. Two clips are of particular interest, as they show the flag being deployed (2.8Mb) and the flag not waving (1.4 Mb) as astronauts collect lunar samples nearby. As you can tell from the shadows on the lunar surface, the camera was mounted on the side of the LEM (to access additional videos, visit http://spaceflight.nasa.gov/gallery/) As you watch these videos, it is interesting to note that the flag only moves when the astronauts are touching it, and moves considerably when they are forcing it into the Moon's terrain. As the astronauts work, watch the shadow created by the flag for a more precise idea of exactly how, and more importantly when, it moves. *Some of the links at this site focus on the "waving flag"